Why use a bio-cellulose facemask? What is a bio-cellulose facemask? A facemask is a great addition to introduce into your beauty routine to help boost skin hydration, smooth fine lines and nourish skin. There are a number of different kinds of facemask on the market, so what’s the difference between a sheet mask and a bio-cellulose mask? Put simply, the material. 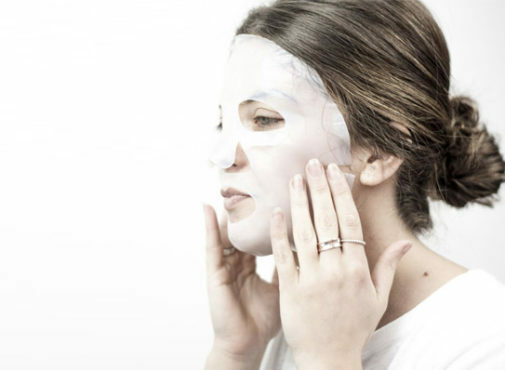 Sheet masks are typically made from paper and can be difficult to keep on, especially if you’re a multi-tasker and like to tackle the vacuuming whilst enjoying your mask! Bio-cellulose is a super thin, all natural fiber that was originally developed as artificial skin to heal and soothe burns and dress chronic wounds. Hugging the face much like a second skin, bio-cellulose masks create an occlusive barrier, physically sealing in the active serums underneath; helping to more effectively deliver vital nutrients right to the dermis of the skin. In short the bio-cellulose difference is essentially more skin contact + higher penetration = More active ingredients delivered. If you have only ever tried traditional clay mask formulas or paper sheet masks treat your complexion to some serious indulgence akin to a professional facial with a bio-cellulose mask. Convenient – Easy and mess free compared to traditional clay masks. Tightly woven and very durable, they don’t rip or tear like paper masks and wont dry out during use. Regular use – Use weekly or monthly to maintain complexion and restore skin surface, boost hydration, sooth and health skin. Jet setters – Bio-cellulose masks are ideal to travel with, as unlike traditional cream masks they are mess free – no hand washing required. Once you have removed the sheet, you can even leave the serum on as your moisturiser for the rest of the flight for extra hydration. Post treatment – Use after facial treatments such as laser procedures and chemical peels to hydrate and calm the skin (please always check with your dermatologists before use after particular treatments). – Soak it up; Keep the excess serum on your face to take full advantage of the ingredients. You can even apply extra serum that may be left behind in the packaging to your neck and décolletage. Click here to try the ProPlenish Bio-cellulose masks which contain a potent anti-ageing blend of Swiss Snow Algae, hyaluronic acid and three active botanicals. All of which help to boost collagen and elastin production, reduce the appearance of fine lines and wrinkles, repair, hydrate and protect the skin.